January 1st 1884 It was a snowy stormy day, I was at work about the house most of the day. Just before night I went over to Hatts and Ott came over there to take me to the St James to a ball. Had a very pleasant time and stayed at Hatts all night. 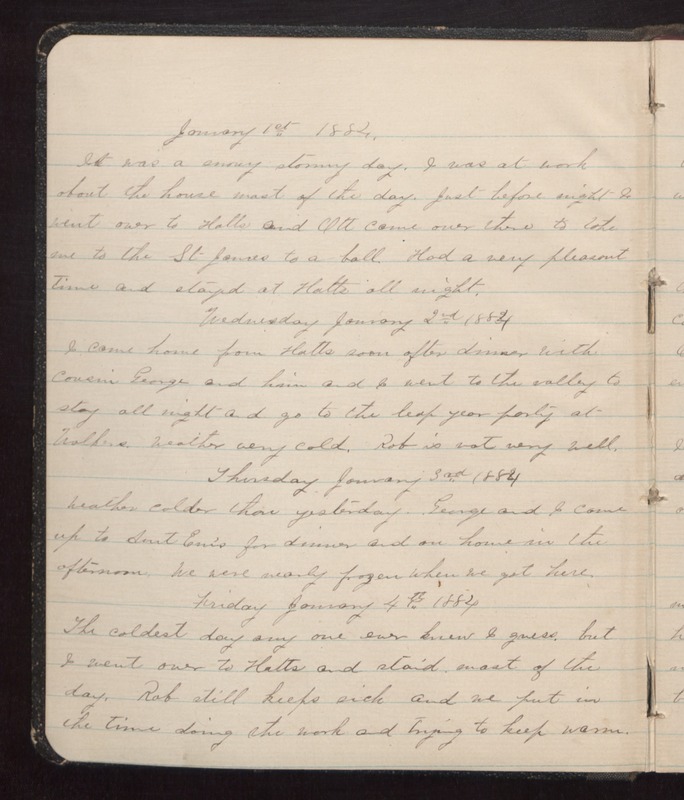 Wednesday January 2nd 1884 I came home from Hatts soon after dinner with Cousin George and him and I went to the valley to stay all night and go to the leap year party at Walkers. Weather very cold. Rob is not very well. Thursday January 3rd 1884 Weather colder than yesterday. George and I came up to Aunt Em's for dinner and on home in the afternoon. We were nearly frozen when we got here. Friday January 4th 1884 The coldest day any one ever knew I guess, but I went over to Hatts and staid most of the day. Rob still keeps sick and we put in the time doing the work and trying to keep warm.